At Sacred Heart Cathedral School, we are incredibly proud to offer a dynamic arts program. Our music, art, and drama offerings allow children to explore their creative sides and discover new passions, while also strengthening their cognitive abilities, social skills, and problem-solving abilities. The arts teach children to make good judgments about qualitative relationships. Unlike much of the curriculum in which correct answers and rules prevail, in the arts, it is judgment rather than rules that prevail. The arts teach children that problems can have more than one solution and that questions can have more than one answer. The arts teach students that small differences can have large effects. The arts traffic in subtleties. The arts help children learn to say what cannot be said. When children are invited to disclose what a work of art helps them feel, they must reach into their poetic capacities to find the words that will do the job. The music program at Sacred Heart Cathedral School provides children with a jubilant, hands-on learning experience. Children can let loose and have fun during music class. Doing so develops within them a love of music as they learn to sing beautiful hymns, folk songs, contemporary songs, and even classical music. Students have numerous performance opportunities including the Christmas Concert, Spring Concert, assemblies and leading music at school Masses. During the school day, students are also able to take choir and instrumental electives under the direction of Natalie Kimbro, director of the SHCS music program, and Robert McCarter, organist at Sacred Heart Cathedral. Students in orchestra and piano are taught fundamental music theory: music reading, rhythm, key signatures, chords, and scales. In addition to learning music in the lesson book, students are encouraged to create their own original compositions. In addition to receiving classroom music instruction, students can participate in the SHCS Youth Orchestra, the Music Club, and the Youth Choir to further enhance their learning and passion for music. Click the button below to learn more about the extra-curricular music offerings at SHCS. The visual arts at SHCS strives to teach students that there are many ways to see and interpret the world by providing hands-on opportunities for students to interact with and relate to the world around them. Images become real. Children experience and discover the variety of what we are capable of feeling and make vivid that our thoughts are limitless. In their visual arts classes and our summer camps, students can engage with a variety of media, including paint and pottery. 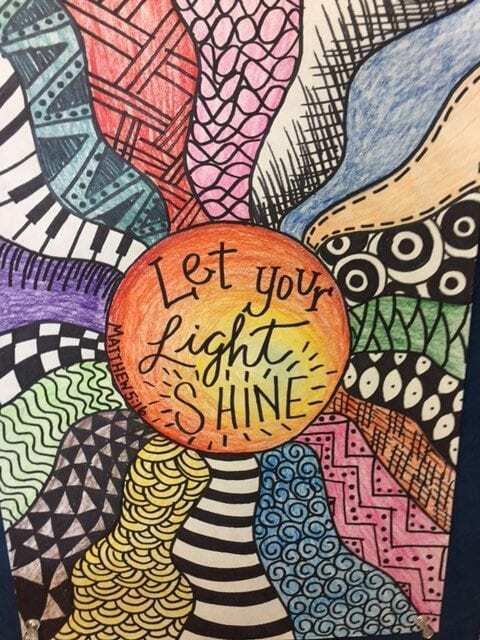 This allows each child to discover his or her unique artistic gifts and lets their lights shine! Click the button below to get the latest news from our visual arts program! The Sacred Heart Theatre Arts program is designed to prepare students for the study of acting, dramatic literature, and theatrical production, and to nurture an appreciation for the many forms of theatre. Through research, planning, scripting, and performance experiences, the student will acquire skills in communicating ideas, critical thinking, and collaborative problem-solving. In fall 2018, drama students performed a theatrical adaptation of Alice in Wonderland.